The impulse buy; they can be so satisfying, or (more likely than not) so regrettable. This little -ha hum... more on that later- duo ended up falling into the latter category. While it's no fault of the actual product, this duo does have some major faults. The major fault is the size vs. value. As I mentioned, these were an impulse buy. They popped up under the checkout on the Sephora website and I took the bait. For $12 you got two primers. Now, I knew they wouldn't be huge, but these are small, tiny, itty bitty. The tubes are smaller than I expected, but are they 3/4 full? 1/2 full even? Not at all. 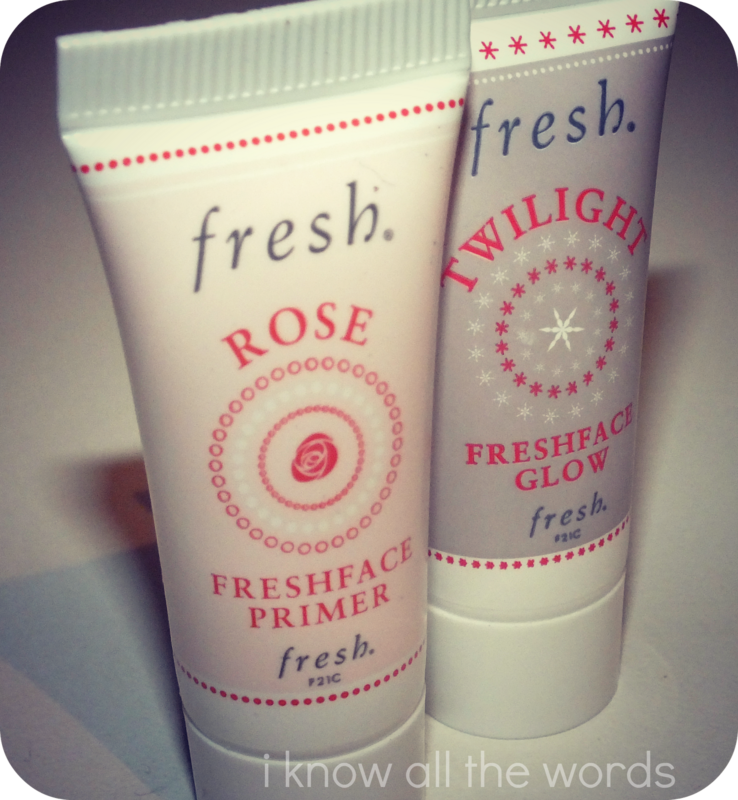 I thought that they felt light, so I held them up to a lamp and discovered that they are only filled to just about the word 'Primer' on the tube. Said and done, there is about a tablespoon of product in each tube which is about two uses- three if you cut the tube and get every last bit. I ordered this months ago and put it in the 'try' pile. If I had really taken the time to look at it, I would have returned it. The fact that they make the tubes one size, then put such a small amount in them is a trick I've been seeing more and more lately. I've noticed it more so on deluxe size samples, which is still kind of dirty, but at least those are free, but this is a product they're expecting consumers to buy. By pushing it online, as Sephora did, they know it's going to sell since you can't really conceptualize it being that small, no sane person would buy it in store. 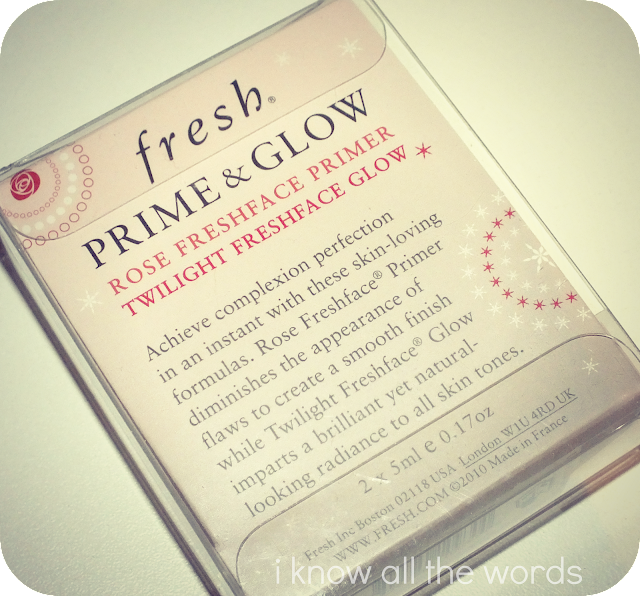 As a primer, the product isn't bad. It has a very light, natural rose scent, which I don't mind because it is so light. I'm not a huge fan of rose scents, but it is a real scent without the synthetic notes some products have. It does make the texture of my skin feel smoother, which is never a bad thing, but I don't think it did all that much in terms of how my foundation applied or wore and my pores seemed the same as without this primer (ie. huge). Based on how the product performs, and the rose scent, I would say that Twilight is the same formula as the Rose version, but with the addition of mica. 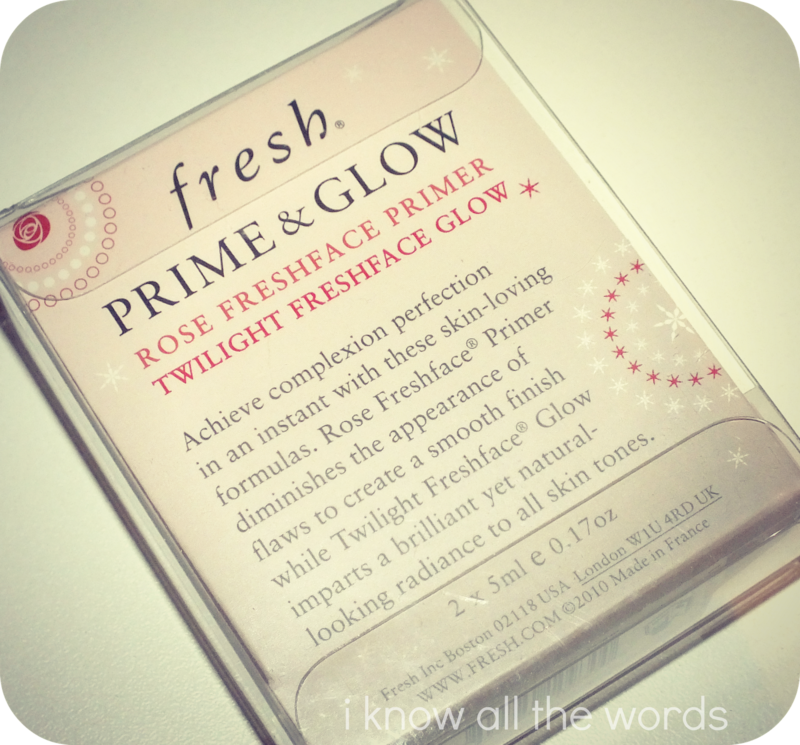 I quite liked the glow that this primer gave. The mica is very refined, with no pieces of anything (ie. glitter) give a really subtle glow that makes your skin look dewy and fresh. The effect can get lost with heavier foundations, but with sheer foundations and tinted moisturizers it's quite nice. Alternatively, you can use a dab of this as highlighter on cheek bones and what not. 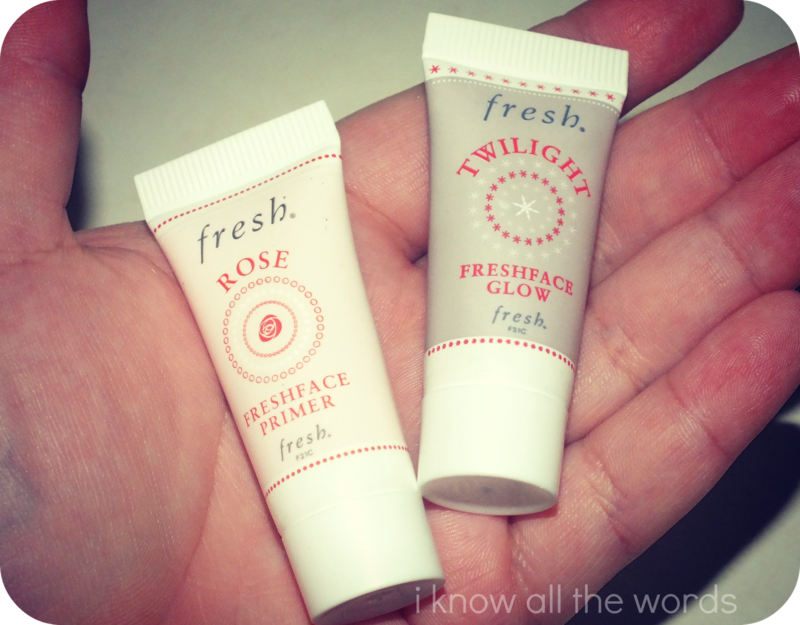 Overall, these aren't bad primers. I don't know if I'd purchase the full size versions, but I don't hate them either. I do however, take issue with how they went about packaging/pricing this duo and will make me think twice before purchasing another Fresh product. 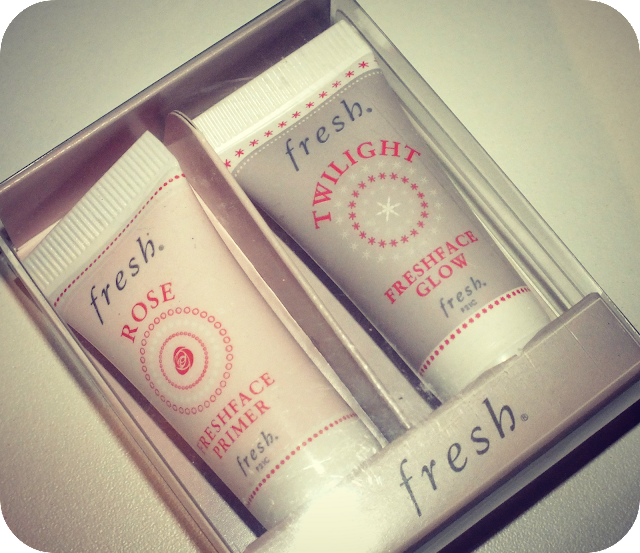 Avialibility: Sephora, $12, 2 x 5ml tubes.